Her website says that she “refuses to sit still.” She played rugby with the Utah Scorpions for a few months after her injury, then decided to compete in the national Ms. 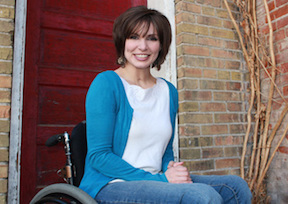 Wheelchair America Pageant as an independent delegate (Utah had no Ms. Wheelchair program) and she won the “Spirit Award.” She and her soon-to-be husband, Whit, founded Ms. Wheelchair Utah and she directs the pageant. She earned her bachelor’s degree in communications with a minor in English from Weber State University. She gives as much as 14 speeches each month. Many of her speeches have been recorded onto CDs and compiled into books. She is a member of The Church of Jesus Christ of Latter-day Saints. She and her husband are the parents of one daughter.